Is this the end of a fraught conflict? "Arras has never felt comfortable with its most illustrious native son" (Kaplan, p.450). This is something of an understatement. Rejected throughout the nineteenth century as a bloodthirsty monster, in the nineteenth century Robespierre was held responsible for local as well as national depradations. Plans to erect a statue to his memory in Arras, formulated in 1848 and reiterated by Louis Blanc in 1870s, fell on deaf ears. In the early years of 20th century Albert Mathiez and Charles Vellay founded the Société des Études Robespierristes, with the objective of rendering Robespierre "the justice that is due him", mainly through critical editions of his work and scholarly studies. 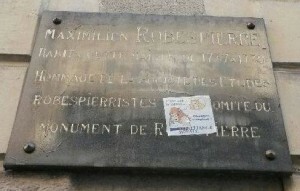 In October 1723, after sixteen years of lobbying, the SER succeeded in having a plaque erected on the Maison Robespierre. The ceremony was presided over by by Mathiez and the Left-wing mayor of Arras. Gustave Lemelle. The favourable press reported that five hundred persons attended; according to opponents, there were fifty "drinkers of blood", "mostly foreigners". Mathiez's further plan to erect a statue continued to meet with stiff opposition. In 1925, just as he was on the brink of success, the plaque on the Maison Robespierre was vandalised and had to be removed removed. (It was later replaced but so high up that no-one could read it.). Finally in 1932 the municipal council, which was controlled by the Radical Socialists, agreed to a monument to be furnished by the SER and annonced a solemn ceremony of dedication to be held on 15th October 1933. The road in which the Maison stood was also renamed rue Maximilien Robespierre. Local politicians tried to play down political significance of the move, casting Robespierre as a distinguished local lawyer, academician and member of the Rosati. A bitter quarrel ensued. A committee of opposition was formed and the head of the order of lawyers and the president of the Academy both refused to participate in the dedication ceremony. When members of the Rosati agreed to co-operated, their president, Émile Poiteau, resigned. The Arras newspaper Le Courrier published lists of local victims of the Terror - 1,675 names in all - and there were demandsfor the ceremony to be banned in deference to the dead. Poiteau's call for a boycott was seconded by the bishop of Arras. On the morning of the dedication, the anti-Robespierrists set up three model wooden guillotines, filled with cement and weighing two hundred kilograms each, at the site of the Revolutionary executions and on the major squares; cardboard heads were hung on lamposts and red paint poured in the streets to simulate blood. Despite the claim that the guillotines were bobbytrapped with bombs, the police successfully dismantled them and arrested a royalist lawyer who had tried to paint the mayor's house. The president of the SER,Georges Lefebvre and his delegation were greeted at the railway station by three Socialist deputies of the region and the ceremony passed without incident, though most of the elected officials of Arras avoided the luncheon banquet. The gathering was addressed by the mayor and by the great grandson of the physician who had attended to Robespierre's wounds in Thermidor. Lefebvre's keynote lecture, delivered to an audience of several hundred in the municipal theatre, praised Robespierre as the apostle of social democracy and a pragmatic defender of the nation. The bust, sculpted by Maurice Clodel, was supposed to have been placed in the gardens of the Palais du Vaast. but was instead installed in the reception hall of the Hôtel de Ville. It was then temporarily relegated to a back room where it remained for many years. In the post-War years, with the expansion and modernisation of Arras, passions lessened, but nonetheless controversy was not entirely dead. 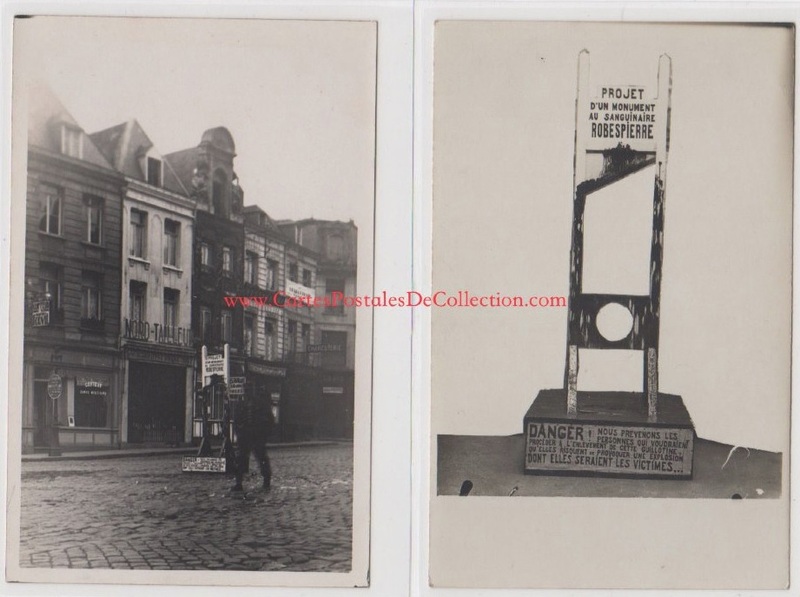 In 1958, the bicentenary of Robespierre's birth, a series of commemorative projects was proposed, but vetoed at the last minute by the national government despite support from the mayor of Arras, the Socialist leader Guy Mollet. There were some concessions. Local history teachers, campaigned to have a school named for their hero, and the Arras boys' high-school was finally rechristened after demands from the students themselves during the demonstrations of May 1968. (However, an official inauguration of the new Lycée Robespierre has never taken place). 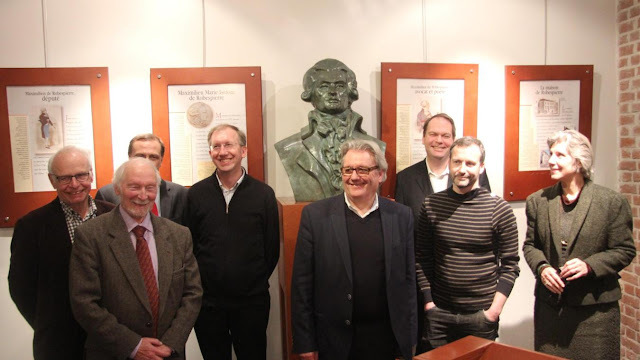 With the bicentenary looming, a new local pressure group, the Amis de Robespierre pour le Bicentenaire de la Révolution was founded in 1987, the under presidency of a local lawyer Fernand Bleitrach. By 1989 the ARBR had 450 or so members in the region and instigated a number of different commemorations, including a "Robespierre day" organised in conjunction with the Société des Études Robespierristes. At this event, in June 1988 ,Michel Vovelle, president of the SER , travelled to Arras and, evoking a lecture given by Mathiez in Arras in 1920, delivered an address on the theme: "Why are we still Robespierrist"? . Discours prononcé au théâtre d'Arras le 11 juin 1988 par M. Michel Vovelle...: Pourquoi nous sommes encore robespierriste", Annales historiques de la Révolution française, 1988 274(1) p.498-506. In 1990 the ARBR succeeded in having a copy of Claudel's statue erected in the courtyard of the Lycée Robespierre. In 1992, after a determined campaign by the ARBR, the Maison Robespierre was finally acquired by the municipality. However, the space was not given over to Robespierre himself but instead housed the collections of the Compagnons du Tour de France. In 2011 an Association pour un Musée Robespierre was set up to renew the issue of a museum. In December last the Mayor and Town Council gave their support in principle to the project. 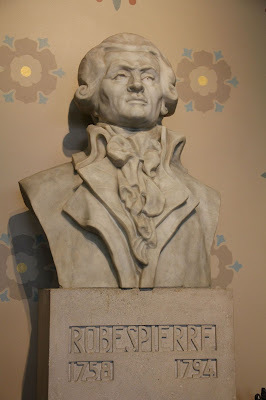 According to La Voix du Nord, they were swayed by considerations of tourism; adverse reviews on "le célèbre site Internet de voyages TripAdvisor" amply confirmed that most visitors came to the Maison Robespierre expecting to find echoes of its famous inhabitant. There was some initial suggestion that the museum should include all famous "enfants d'Arras", but this may have been a tactic to diffuse opposition. The Comité Scientifique, which was appointed to investigate, is headed up by Gérard Barbier, long-time ally of the ARBR, and includes Robespierre's biographer Hervé Leuwers. The group made its initial report in May. They stated a general intention to create "a centre of interpretation rather than a museum" and to involve other historic sites around Arras. They hope to have a preliminary exhibition available soon. • M. Alain NOBILOS, Arras historian and campaigner for Arras architectural heritage. • M. Hervé LEUWERS, Professor at the University of Lille 3, director of the Annales historiques de la Révolution française, biographer of Robespierre. • M. Jean-Pierre JESSENNE, Professor Emeritus of Lille 3. A specialist in history "au village" in 18th-19th France. • Mme Martine AUBRY, Digital humanities specialist, Lille 3. Géraldine Csizmadia , "La Maison Robespierre va accueillir les « enfants d’Arras »", 14.12.2016. Achille Thomas, "Le comité scientifique en route pour penser le futur de la Maison Robespierre". , 12.02.2017. _____, "Et si le révolutionnaire Robespierre attirait les touristes dans la région?" 28.05.2017.